Naked Wines Australia | Blog | What Is Grape Pressing? Winemakers Adrian & Rebecca Santolin have recently taught us the difference between supermarket grapes and wine grapes. And now they’re back with a little #Nakeducation on what exactly pressing is, in relation to making wine! It begins with the fruit arriving at the winery (our beautiful Yarra Valley fruit is all carefully hand picked), and then being pressed off. I’m sure you’ve all heard this term before, but what exactly is pressing? Well, the word itself pretty much sums up the process – the grapes are pressed to release their juice, however, how exactly, does this process occur? Inside our press, there is a bag to one side and screens on the other side. The bag/bladder slowly inflates and deflates, a gentle process that presses the grapes against the screens, releasing the juice through the screens and into the tray underneath. 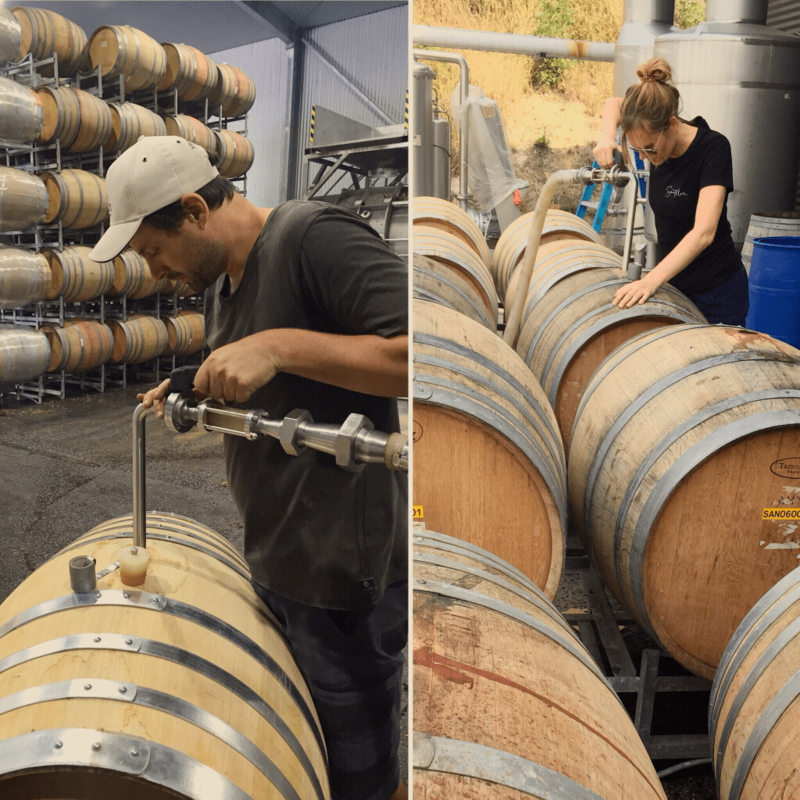 Depending on the style of Chardonnay you want to make, some winemakers will put this juice straight into a tank to ferment, however, we put it straight into French oak barrels – and then begins the fermenting process. We choose to do it this way to bring complexity and depth to our Chardonnay – which will eventually make its way into your 2019 Family Reserve range. And that’s the pressing process! Now… back to making wine! Follow winemakers Adrian & Rebecca Santolin for more wine education post and updates on their Yarra Valley vineyard. Angels, invite your friends to join our awesome community to receive a credit in your Naked Wines piggy bank, they’ll also receive $100 off their first case. Become an Angel (customer) and join the winemaking revolution! Angels, support independent, Aussie and New Zealand winemakers while receiving better wine for their money. For more information check out our website.